The primary objective of this course is to provide the student with a fundamental knowledge of Autodesk Inventor. 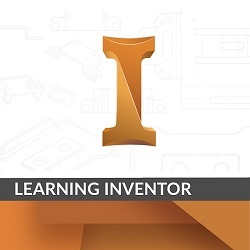 This course is separated into 11 modules covering key areas of manufacturing design in Inventor. Open and view Autodesk Inventor files, set the project file, and view part and assembly models. Create assemblies, edit part relationships, and create assembly representations using Autodesk Inventor. Create and edit presentations of your assemblies using exploded views and animations. Create and edit 2D documentation of your 3D designs using drawing views and styles. Fully document your 2D views using dimensions, tables, leaders and symbols. Reuse native AutoCAD data to define part sketches in Autodesk Inventor. The Inventor Certified Professional Practice Exam included with this course will test your readiness to take the real exam at a Certiport Authorized Testing Center. You will be tested on the official exam objectives with questions that are designed to simulate the real questions you will experience on the official exam.